Looking into an amazing and unique party idea for your loved one? Your search has ended! iFLY is an indoor skydiving experience that creates true free fall conditions, just like skydiving, without having to jump out of an airplane. iFLY’s vertical wind tunnel generates a wall-to-wall cushion of air, on which you safely float. There’s no parachute, no jumping, and nothing attaching you to planet Earth. It’s just you and the air, and it’s the most incredible adrenaline rush! iFLY hosts groups and parties of up to 100 people from age 3 to 103! With several customizable packages to choose from, your iFLY event is sure to be unforgettable. 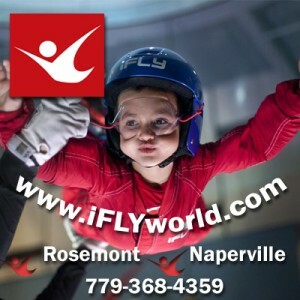 Visit www.iflyworld.com or call 779-368-4359 to book at either of iFLY’s Rosemont or Naperville locations.